If you thought only banks were jittery about the on-going reality and rumours of corporate debt defaults, you are wrong. Mutual funds (MFs) have also felt the tremors, with top schemes holding more than Rs16,000 crore worth of debt securities of shaky group companies like Essel, DHFL (Dewan Housing Finance Corporation) and the IL&FS (Infrastructure Lending & Financial Services) group, according to a study by India Infoline. The first blow to fund houses came in September 2018 when IL&FS defaulted on inter-corporate deposits and borrowings, and credit rating agencies downgraded its credit ratings by several notches in a single instance. As the months passed by, more troubles at companies, such as DHFL and Essel, came into the open. Once again, MFs panicked and investors faced losses. This is the list of the fund houses with the highest exposure to these companies’ debt. For the MF industry, which manages over Rs22 lakh crore of investors’ assets, an exposure of around Rs16,000 to Rs20,000 crore may look like chump change. 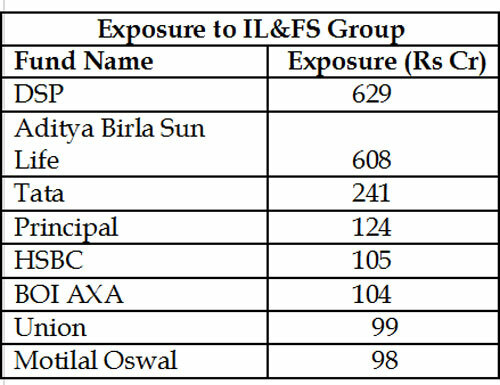 However, the real loss is faced at the scheme level, where exposure can vary depending on how the fund manager has diversified the schemes’ portfolio. We had discussed recently about a short-term debt scheme that had more than 30% of its exposure to a single borrower – DHFL – that could lead to huge losses to investors, in case DHFL defaults. 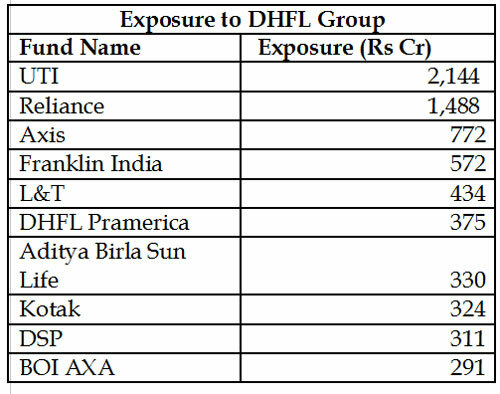 The housing finance company – DHFL – is already under probe by the ministry of corporate affairs (MCA) for alleged fraud involving siphoning off debt money into offshore assets and shell companies, as exposed by Cobrapost. Essel group chairman Subhash Chandra is also in talks with banks and MFs, to allow him some time and not declare his debt as default. 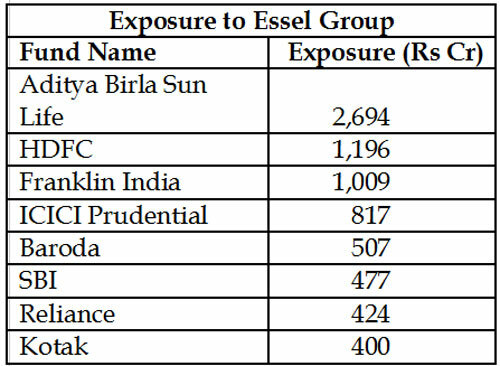 News sources claim that the Essel group chairman has given a personal guarantee for his payment obligations to his creditors, mostly MFs, on an ‘irrevocable and unconditional’ basis. Financial markets, banks all are looting common man's hard earned money, without any problem or punishment, on the sly taking advantage of loopholes. We elect governments so that we get a peaceful sleep, but where is that sleep, now what should we do? For a small investor, it is a shock. Am a Senior citizen, 71 yrs. Which specific schems of the MF houses have the exposures ? Just goes to show how daft the so -called great fund managers of mutual funds are.They are actually suicidal to trust and it is almost certainly suicidal to invest in mutual funds. will be happy if,mf sabi hai, ads r stopped immediately. Our regulators like SEBI exhaust their energy in flimsy matters like self declaration by IFA'S, no commission on IFA'S own business and other flimsy regulation. If this energy would have been in supervision of fund houses investor's would have been saved. Our regulators don't stand to what they owe to.